Chaz Dean spent 9 months in a lab creating the product we know as Wen. He had pressure from the company to launch the product early but decided against it. He wanted Wen to be perfect being that it was fully connected to his name. Since Chaz worked in a Bel- Air Salon he was able to become the manager and soon after by the salon and promote his product. After 5 years he tried and tested out his products on his clients gaining the support he needed to have a celebrity-based clientele. After word spread many actors came into his salon looking to gain knowledge about the way to get healthier shiner hair. Wen.com has a 5 in 1 conditioner that takes the place of shampoo, conditioner, deep conditioner, leave in conditioner and detangler. It provides a healthier alternative to the harsh chemicals of many shampoos. It provides clean manageable hair without sulfate. With its perfect blend of herbs and extracts it is a gentle cleanser for all hair types. According to wikipedia.org, after doing a study on this product there were positive feedback that this conditioner adds shine, more moisture and detangles the hair making it more manageable. The almond mint scent is alluring and pleasant. There are also other scents like cucumber, fig, pomegranate, and lavender. Chaz also has seasonal scents available. Buying a 16 oz bottle of this conditioner is $36.00 on QVC. This price is a reasonable price because the product has multiple benefits and goes a long way. Also, another positive to this product is that it is made for all hair types. Meaning that no one is left out to reap the benefits of healthy shiny manageable hair. Wen has been displayed on many TV networks and luckily has an easy to use website (wenhaircare.com) for your ordering needs. The Brown Agency is a platform that dedicates full-service to grooming talent, representing models and actors in various capacities such as print, catalogue, commercials, film, fashion runway, videos, conventions, voiceovers, trade shows, corporate and promotional events and much more. The talent agency brought itself to Austin in 2010, quickly establishing a reputation of a leading agency in the market. Its goals have been to set high market standards and raise expectations to observing an unprecedented talent display. Justin Brown’s talent agency holds perceptibility in selecting the bet candidates and grooming them to the standards appreciated by the renowned high end brands in the world. The agency has seen their models going on to work for top notches such as Louis Vuitton, Toyota, Dell, Loreal, and myriad of other companies. The acquisition of Heyman Talent South and its relaunching as The Brown Agency is a powerful combination that has rendered both companies the largest talent joint in the region. Bolstering the unique capabilities, strengths and and potential of The Brown Agency, has made it into a full blown talent company in Texas. It now provides clients with a broadened and versatile portfolio of well prepped and experienced talent. It also renders great opportunities to the members of the agency. Justin Brown sees the merger as an integral part of of his company’s growth strategy. Both companies pride themselves with their expertise in training models for a larger market place and commitment to serving their clients. Justin brown leads The Brown Agency as a CEO and President. Having worked his way through a modeling career, Mr. Brown eventually landed himself in the development and placement field. His keen interest in learning about the life behind the camera led him to become a trainer. With a significant amount of experience with various agency jobs, he started off training talent to operate in professional settings. Brown managed college by modeling for the Lucky Brand during his early days. He studied business management prior to discovering his potential as a trainer. For more details visit Crunchbase. Brown has groomed talent and placed them on greater platforms. His experience in Los Angeles and New York has indicated he could promote promising talent to even bigger agencies with his set of skills and expert training. Austin has been central to his career expansion, as Brown chose to accentuate the fashion industry and make his mark. After moving there in 2005, he describes his adaptation to the place as a natural connection that just formed. He sought to take the industry to a big market level by hiring locals and yet looking national. He takes into account regional differences and local taste of fashion and delivers accordingly. The days of operating runway shows in Austin bars are long gone, according to Mr. Brown. His company is headed in the direction of revolutionizing runway shows by conducting national shows from his own hometown. Lime Crime is a cosmetic company founded in New York City, New York by Doe Deere. They are now headquartered in Los Angeles, California. For those readers unfamiliar with Deere and her company, don’t get worry lines. Here is a bit of background on the subjects in question. Doe Deere, legally known as Xenia Vorotova, is not only the founder of Lime Crime but also the CEO and the owner of the makeup company. She is a native of Russia but she grew up in New York City, New York. She started the company because she could not find makeup products that were quite colorful enough to go with the custom line of clothing she was marketing on Ebay. The official Lime Crime company launch occurred in October of 2008. It began with several different brushes, eyeshadows, glitters and a primer. Doe followed these up with her distinct and unusual Unicorn Lipsticks the following year. The company states that their original Velvetines line of lipstick, which they first put on the market in 2012, was what ignited the entire liquid to matte lipstick movement present today. Lime Crime products have always been cruelty free. Much of their product line has also been vegan since the company began in 2008. Doe, a significant, sometimes celebrity-like figure in her field, supervises all product development and is said to be very sensitive to her customer base. In 2012 she oversaw the reformulation of the remainder of her product line in order to conform with vegan requirements. The Lime Crime cosmetics product line can now be found in retail outlets across the globe in countries such as the U.S., the U.K., Australia, Indonesia, Mexico, New Zealand, Poland, Russia and Thailand. 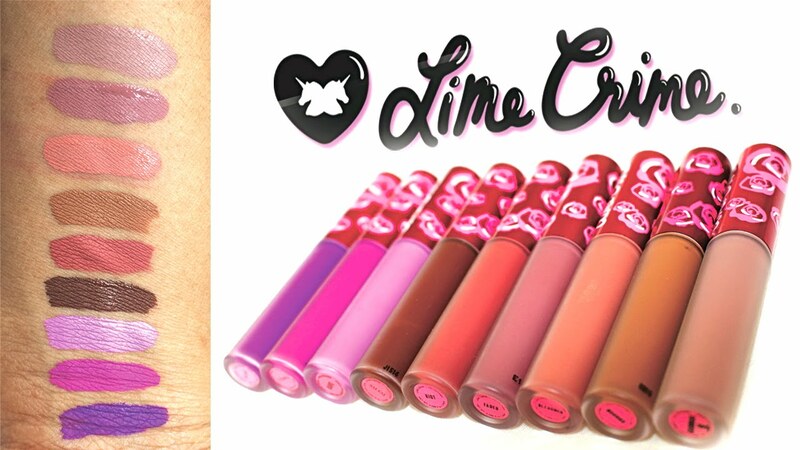 Lime Crime products are also available online through the official company website and many other internet retailers. Check out their tips on Tumblr for great looks, or follow them on Instagram @LimeCrimeMakeup. With warm weather on the horizon and the flowers quickly blossoming around the nation many beauty guru’s have switched their dark lips and heady lined eyes for a brighter, airier look with the added pop of bright colored lips. Many women have begun the search for the perfect lipstick, gloss, or lip stain to make their lips stand out against the soft glow of summer make-up trends. Bright pinks, reds, and even lavender colored lips are on the rise and many beauty addicts in western countries are beginning to delve into make-up from other countries like Korea and Japan. Beauty guru Wendy Huang has helped jump started this trend by creating a welcoming community where she reviews beauty products, skin care, and make-up trends both in western countries and Asian. Her side by side comparisons have helped women all over the world discover these amazing products offered across the ocean and some have even switched over all together. Huang herself is of Chinese decent but grew up in Australia and now runs the countries number one Asian beauty blog channel. Her YouTube channel has over a million subscribers worldwide. The simplistic yet chic styled blog The Wonderful World of Wengieoffers insight with videos, tutorials, and honest reviews of a myriad of products. What makes Huang’s channel unique is her charismatic charm and honest way of talking to her views, or as she calls them her family, without hiding who she is as a person. On her videos she openly uses all the products she’s reviewing so her viewers are guaranteed an honest opinion. From lip stains to bubbling green tea masks Huang covers it all in her videos. Her passion for beauty stemmed from the lack of versatility in both American and Australian media which left her nearly helpless when it came to beauty tricks that worked for her features. After leaving a six figure marketing job to make YouTube her full time job she’s launched into a blossoming career that’s allowed her to travel and meet other guru’s as well as explore more beauty products worldwide.